Yes, it is true. The 6th album from the gifted Colorado Progsters is a reality and when I threw a quick glance at the album' s credit, I was surprised that Ronnie Skeen wasn't credited as a member or a composer! John Lutzow is now the man behind the compositions, while John Sellers accompanies him in the guitar parts. So, after this significant change, I was extremely curious to listen to the new stuff. After several spins, the listener can realize that Leviathan are meant to be always unique. The new album is an ideal soundtrack for the cold, rainy winter days and nights. Sounds that touch the inner self, while the vocal lines are tenderly fit with the melodies, the new CD from the band really contributes a wonderful sample of a genre that remains artistic and free of boundaries. Songs like “Vanity Might Protect”, “Acapello Gold”, “Forsaken, Forgotten, for Nothing” and “Memorized Fairytales” are so emotionally intense and wonderfully structured that satisfy the demanding listener. I would also suggest to pay attention to the solos of the song “Forsaken...” since the strong melodies are a wonderful, dreamy experience! I also enjoyed the heavier moments of the album, such as the song “Third Rail to the Third World” which begins with an intelligent riff, while the lyrics are pretty inspiring and “politically-active”. The opening track,”Blue Screen of Death-THC EMP part I” is also another highlight, with the sing-a-long chorus and the majestic riff to prove that Leviathan are present again. 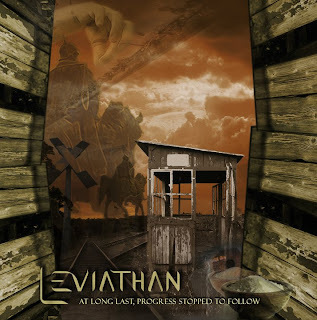 The new Leviathan CD includes also a superb instrumental entitled “Acapello Gold” which is definitely one the band’s most wonderful compositions! I really cannot hide my enthusiasm when I witness bands recording strong instrumental and not just another “filler” for their album. Well done guys! Δ Ι Σ Κ Α Ρ Α !! !